Triggers can be defined in GoAnywhere MFT to monitor for certain events such as when a file is uploaded or downloaded by a trading partner. Based on the user-defined trigger settings, GoAnywhere MFT can run a variety of processes. When a file is uploaded by a trading partner, send an email to an employee. In the email message, indicate the trading partner's user name and file name. After a file is downloaded, automatically move it into an archive folder. After a file is uploaded, run an executable file, batch file, or shell script to process that file. If a file upload is unsuccessful, automatically remove the partial file from the folder. If the user provides an invalid login, send an email notification to a system administrator. When an encrypted file is uploaded, call a Project to decrypt the file and import its contents into a database table. When a file is uploaded to GoDrive, scan it for viruses and malware before it becomes available to other users. Before a Secure Mail message is sent to recipients, scan the attachments for sensitive content for Data Loss Prevention (DLP), and deny the message if needed. 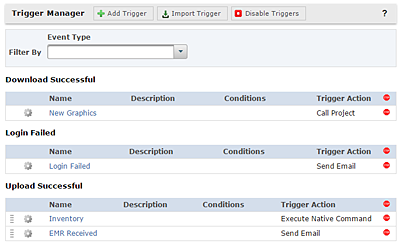 From the Trigger Manager screen you can create and manage Triggers, as well as view the logs of when Triggers have executed. There is no limit on the number of Triggers that can be defined. These Trigger events can be further filtered by user name, file name, file extension, folder name and other criteria.